AZFlow coolers are different in design and operation from other available coolers with these differences responsible for a long list of benefits. These differences and associated benefits (including improvement in cooler discharge temperature) are identified and discussed under the Menu Tab "AZFlow Performance". The air temperature being discharged from the evaporative cooler is of great importance In a displacement cooling system. 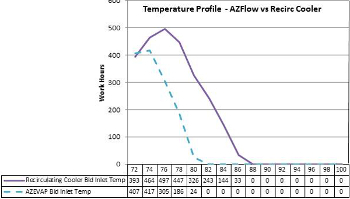 The AZFlow cooler consistently produces lower outlet temperatures than recirculating coolers with the combination of AZFlow coolers and displacement cooling producing a work area environment that is close that of a refrigerant cycle air conditioned system without the high capital and operating costs. All evaporative coolers operate under the limitations of the psycrometric behavior of air as it passes over wetted media. In this regard, a joint frequency psycrometric chart showing a year's worth of Dry Bulb and Wet Bulb temperatures at the facility location is an effective way to portray the inlet conditions to the evaporative cooler and project the cooler outlet temperatures. Namely, air passing through an evaporative cooler starts at one of the joint frequency points on the curve (Dry Bulb and Wet Bulb temperatures) and proceeds along the Wet Bulb line with reduced Dry Bulb temperatures as water is evaporated and latent heat of evaporation is transferred from the air to the water. The evaporative cooler outlet temperature is determined by the efficiency of the heat and moisture transfer processes taking place in the media. The outlet temperature is calculated by subtracting the entering Wet Bulb Temperature from the entering Dry Bulb Temperature and multiplying this result by the cooler efficiency and then subtracting this result from the Entering Dry Bulb Temperature. Media � AZEVAP uses corrugated heavy bond cellulose media that has been tested and conditioned to assure that the rigifying agents have been applied consistently at a level that supports long term operation but does not restrict water adsorption and wicking. Media adsorption and wicking are critical to assuring water distributes evenly throughout the media and provides a wetted surface to the air for efficient heat and mass transport. Geometry and water distribution � AZEVAP has patented a water distribution system and media configuration that assures water distribution through the media in a profile that matches the heat and mass transport behavior of the air moving through the media. This distribution system also uniformly distributes the water across the media such that the media is fully wetted. Liquid to Gas Ratio within the media � A low liquid to gas ratio is used to maximize cooling efficiency consistent with cooling tower and evaporative cooler test results. Consistency and velocity of air through the media window � Media tests have shown that the efficiency of heat and mass transport varies with air velocity. This efficiency is further impacted by variations of velocity on the face of the media in the media window. AZFlow coolers are designed to limit this variation in velocity to less than 10%. Fouling and Scaling of media surface � AZEVAP patented technology meters the water onto the media at a rate to achieve a set cycles of concentration as the water leaves the media and is discharged to the drain system. The control system calculates and controls the water addition rate to maintain this set cycles of concentration dependent on the water chemistry of the water supply to satisfy the practical scaling index criteria. The combination of these features has resulted in commercial installations demonstrating sustainable performance efficiencies at or above 90% (each AZFlow installation has instrumentation to monitor performance) while in field measurements (no installed instrumentation) of recirculating coolers show efficiencies of 70% or less. This translates to the temperature profile curves below for the hourly inlet conditions of a cooling season using ASHRAE TMY3 data for Phoenix, AZ.